Borchert Field: Raising the 1914 Flag, Cont. Raising the 1914 Flag, Cont. 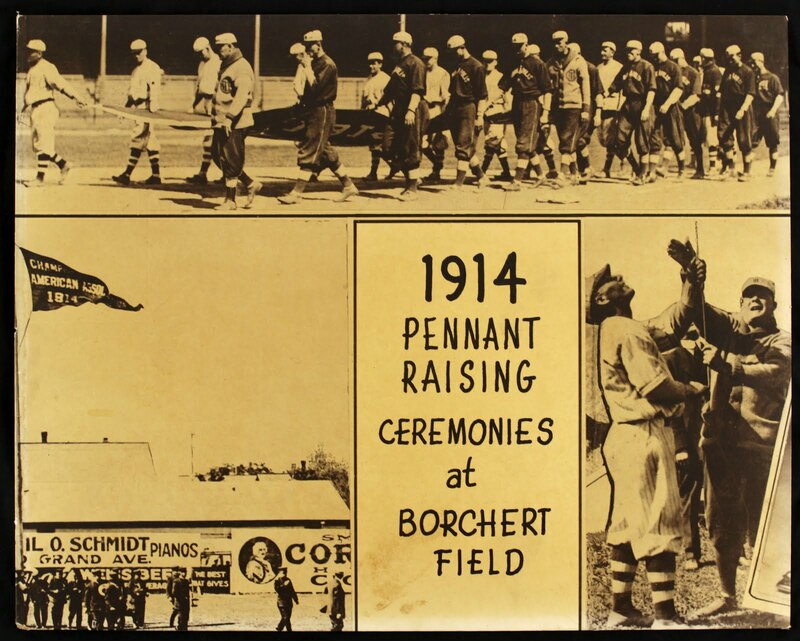 In reference to questions posed in an earlier post on the raising of the 1914 Pennant over Athletic Park, BorchertField.com contributor Dennis Pajot writes to inform me that the 1914 pennant flag was raised on June 22 before the game with the Millers. There was the usual flubdub about hoisting the grandolrag. Preceded by a German band tooting an Irish air the members of the two teams marched from the clubhouse to the home plate, carrying the big pennant between them. Art Dunn, with his hat, not over his ear, but in his hand, then introduced Mayor Bading, who handed Clark and the champs a few verbal bouquets. He told them they were the best ever, and the Millers had to stand there all the time and swallow it just as thought they believed it. After the speech, which brought a big hand from the bugs [early 20th Century term for fans], the band cut loose with another Irish air, and the gang paraded to the flagstaff in deep left, there the bunting was hoisted to the top of the big stick. The athletes, evidently glad that the goose step was over, then hiked back for the diamond and started to tie into each other. Here are the original photos from the Milwaukee Journal of June 23, 1915. 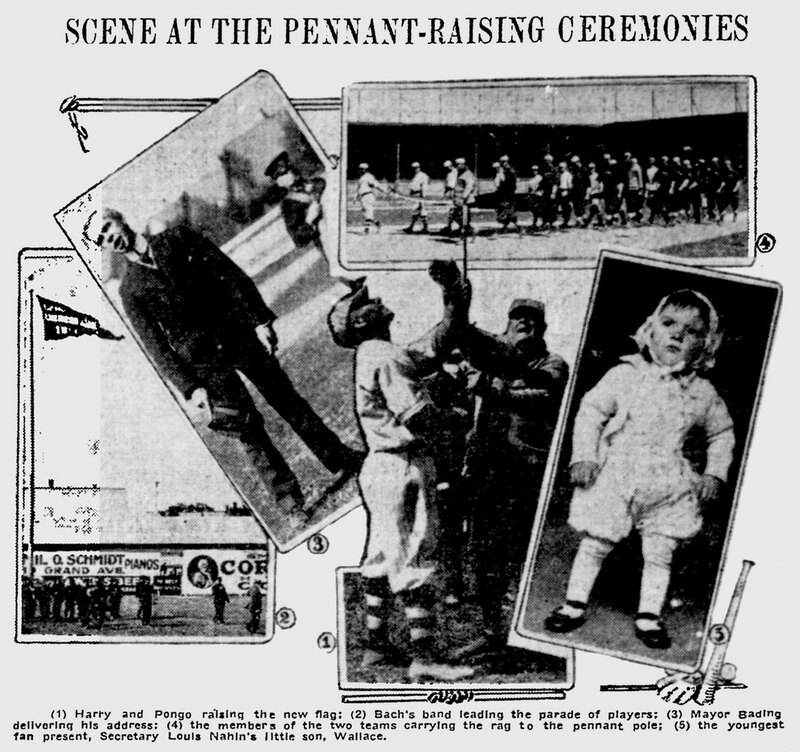 1) Harry Clark and Joe Cantillon raising pennant flag; 2) Bach’s band leading the parade of players; 3) Mayor Bading delivering his address; 4) members of the Brewers and Millers carrying the pennant to the flag pole; 5) Louis Nahin’s son, Wallace. The Minneapolis manager was no stranger to Athletic Park. "Pongo Joe" Cantillon was a Janesville native who had a long career as a manager and umpire beginning in the 19th century. In 1902, he was working as an umpire for the National League when he was hired to replace Brewer manager Billy Clingman partway through the club's inaugural season. He guided the Brews through 1906 before being hired to manage the Washington Senators. Cantillon spent three seasons in Washington before returning to the American Association with Minneapolis. Pitching for Milwaukee at that home opener in 1915 was Cyrus Young. He out pitched the Millers' Earl Yingling for a 2 to 0 win. Young only gave up two hits, Yingling only 5. Young helped his own cause by hitting the single that scored the winning run. What a great way to celebrate the Brewers' pennant-winning campaign.